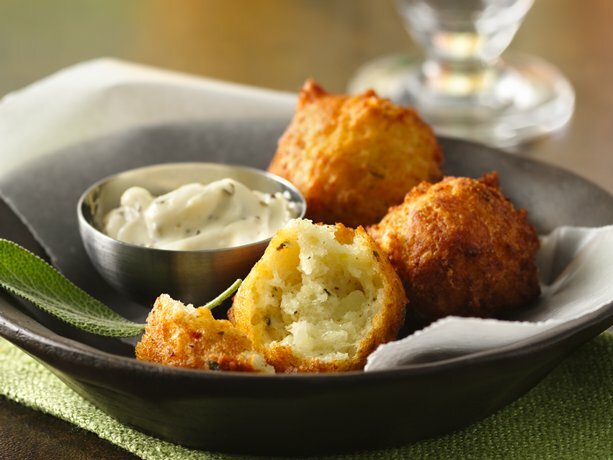 Light potato fritters with a lemony sauce perfect to serve for a St.Patrick’s Day party appetizer! In small bowl, mix warm water, 2 tablespoons flour and the yeast. Stir; let stand in warm place about 30 minutes or until small bubbles form. Meanwhile, in small bowl, mix aioli ingredients. Cover; refrigerate until ready to serve. In 3-quart saucepan, cover potatoes with water; lightly salt. Heat to boiling; reduce heat to medium-low. Cover; cook potatoes about 20 minutes or until tender. Drain; mash potatoes with fork. Cool about 10 minutes. In small bowl, beat eggs and olive oil with whisk; stir in salt, pepper, lemon peel and sage. Set aside. In large bowl, mix mashed potatoes with yeast mixture and 2 cups flour. Stir in egg mixture until well blended. Cover with towel and set in warm place about 1 1/2 hours or until potato mixture is double in size. In deep fryer or 4-quart Dutch oven, heat vegetable oil (2 to 3 inches) to 350°F. Drop potato mixture by tablespoonfuls into hot oil. Fry 3 to 4 minutes, turning once, until golden brown. Drain on paper towels; serve warm with aioli. Love perfect party appetizers like this! Looks so delicious! Iw= will have to try it … soon!